Teaching kids to make healthy food choices is a topic that I have talked about often here on the blog. You see, some time ago I read that when asked, many children had no idea where their food actually came from. They didn't know that meat came from animals or fruits and vegetables from plants. I found this interesting, and decided that I was going to make an effort to make sure that my kids knew otherwise! Having a husband that grew up on a hog farm, the meat part was actually pretty easy to explain. Next came produce. I didn't want to just tell them...I wanted them to experience it firsthand. So we planted a garden. Honestly, I can't say that this was all the successful. We found our soil wasn't that great at the home we were living and we struggled with flooding. We ended up with some tomatoes, but that was about it. Still, we didn't give up. We decided this year we wanted to try again... but we did things a little differently! As you may recall, we moved last summer and our new yard- while a good size for the kids to run and play- didn't really have an ideal spot for a true garden. And because we moved only a few houses down, we knew we might experience some of the same soil issues we ran across before. So, we decided to go with a container garden instead. I looked into raised garden beds, but found they were out of our budget...so I got creative. I looked around to find what types of containers we had that might work to re-purpose! What I found was my kids old kiddie pool from last summer! 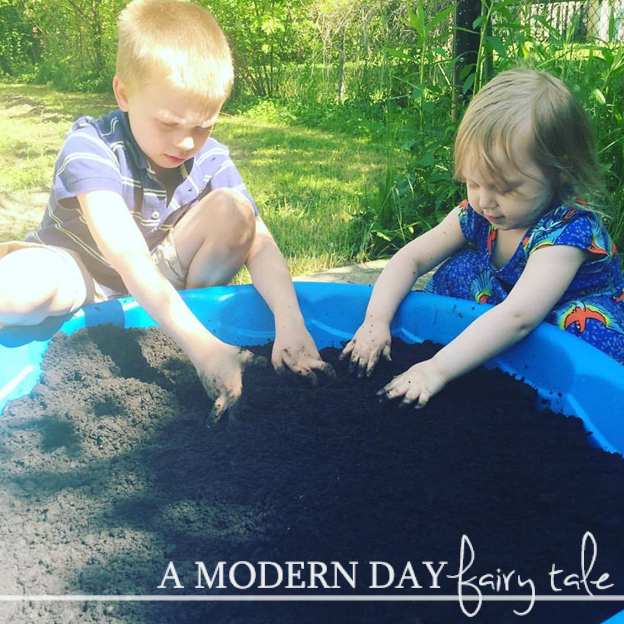 At 8, my oldest had certainly outgrown this tiny pool, and honestly my toddler wasn't far behind... so we decided to create a small garden inside! Want to create your own? It's super simple! First up, prepare your pool. Drill many small holes throughout the bottom of the pool so that water can drain. Next fill with soil. I found for our little pool it took about 3- 3.5 40 pound bags of soil to fill. Now get to planting! You can plant seeds, or have plants already started as we did! You can add any fun little fences, garden decor etc if you like. 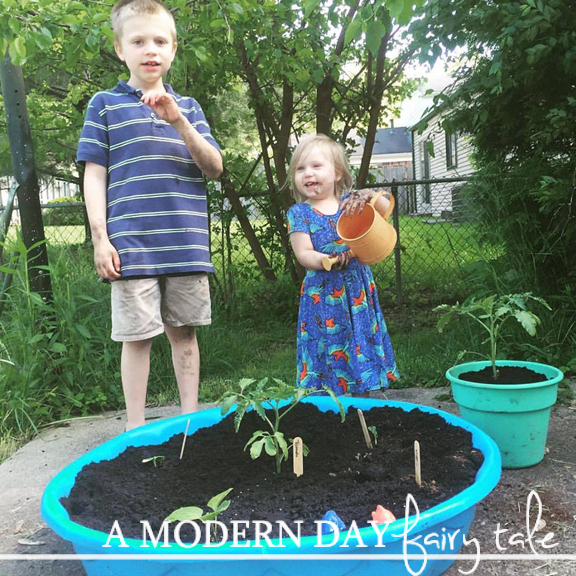 This little pool garden was super simple and inexpensive and truly is a great way to get the kids involved too! It's also ideal for renters like ourselves. Now, I cannot yet say how well our garden will turn out, but we are hopeful! We decided this year- instead of attempting several varieties as we did before- we would pace ourselves and keep it small. We will have tomatoes, squash, zucchini, peas and eggplant. We are looking to add some sweet peppers too, and may find another place for some watermelon...maybe! 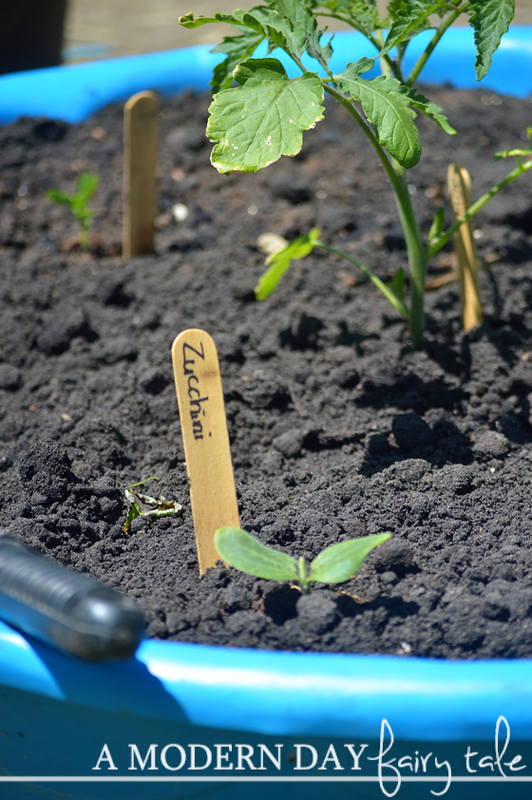 We are excited to watch our garden grow and will keep you updated on the progress as we go! 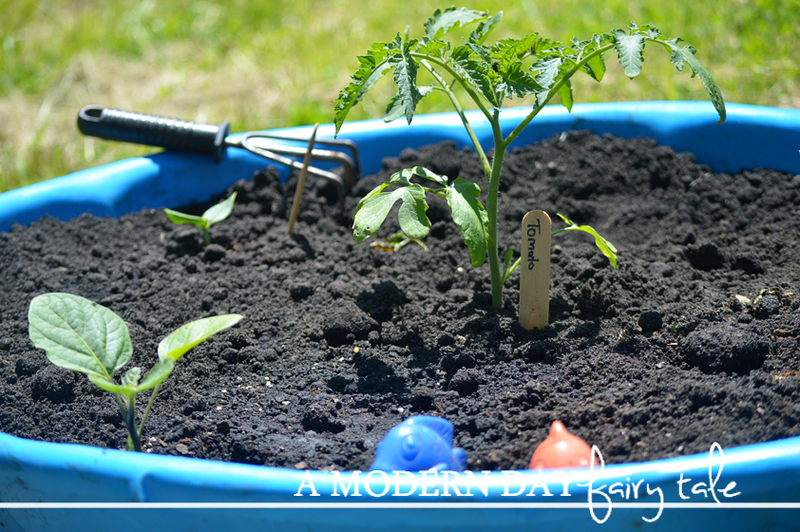 Do you have any more creative gardening tips? I would love to hear them! Please share in the comments below!! I am getting ready to plant my lettuce and spinach in our pools. I will probably put the strawberries in one pool also. This is such an amazing idea!! Is it awful I would've never though to drill holes in the bottom lol?!?! Thanks for leaving us instructions!! This is so cool to look back at this post and to look at your more recent one to see how far the pool garden has come!! I can't wait to get into our new house and get a garden started with my littles!